Green Route trekking is like taking a nature-walk at its best! Where exactly is this route? Well, the Green Route trek is a mesmerizing trail in the midst of the Western Ghats. 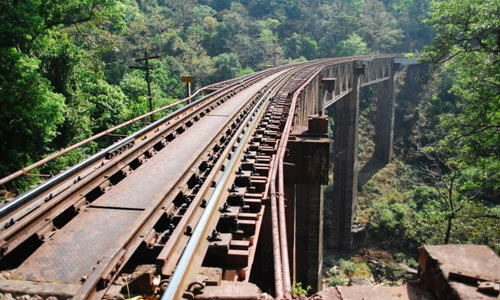 To be precise it lies along the Sakleshpur railway line that runs here from Mangalore. The serene nature walk along the virgin Ghats is an experience to remember. Although many of them claim that the views from the train journey are equally magnificent, only a trekker knows how real and surreal it is to trek in the lap of nature. The experience is different altogether. The Green Route trek begins near the village-side of Sakleshpur. 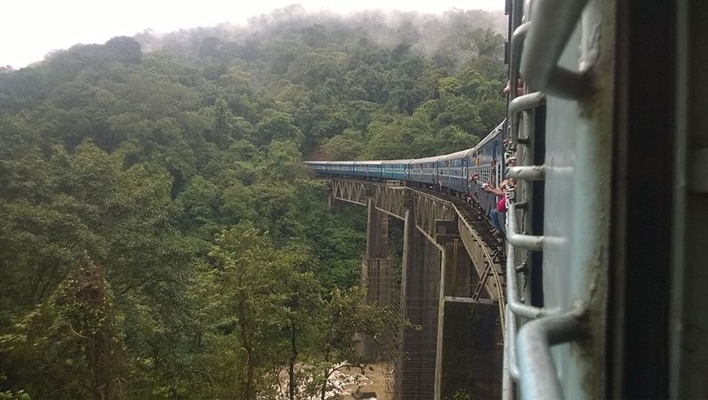 It runs up to the Kukke Subramanya station. Waterfalls, mountains, valleys, tunnels, bridges and a blanket of cozy greens is what you’re going to witness all along the Green Route. Entering tunnels or crossing the rail line in some stretches is banned. Thus, map out your route before heading out. Green Route trek, no doubt, gives you a complete view of the crests and troughs of the Western Ghats. Home to some wild elephants and beautiful flora, you can spot many other creatures along the way. Avoid trekking the Green Route during monsoons as the trails can get really slippery, waterlogged and difficult to tread. Moreover, you will encounter a bunch of leeches while trekking during the wet season. Since you have traveled all the way to the Green Route trek, you must stop on your way back to check the Mallali Falls. These beautiful waterfalls are towards Kodagu and make for great picnic spots too. As an alternative, you could pause by the Shiradi Falls in the Shiradi Ghat of the Puttur Taluk region of Dakshin Kannada. There is nothing better than completing your Green Route trek by halting at a reserve forest. Take a detour to some of the most spectacular rainforests of the Ghats, i.e. the Bisle Reserve Forest. The flora and fauna here is richer than the rest. Dense vegetation and gorgeous valleys line the strip of the forest reserve. This area has the railway station. Many trekkers choose to start from Donigal and end their trek here. It serves as good pit-stop or halt for your return journey. This region is famed for its water activities. It is recommended to spend an extra day here. It houses the famous Jain learning centre. Jains from all over India flock in large numbers here annually. Besides that, it has the famous Thousand Pillars Temple and Chowter Palace. All these features of interest make it a good place to stop and go. The beautiful fort of Manjarabad was built by Tipu Sultan. It lies in Donigal and boasts of French architecture. Its sloping walls impart a star-shaped appearance. It has a deep well within, that just cannot be missed. The nearest airport to the Green Route is Mangalore Airport which is about 140 kilometers. The second closest one is Kempegowda International Airport at 240 kilometers approximately. Take the trains plying to Sakleshpur from different cities of Karnataka. From there, take a taxi to the trek zone or bus to the nearest stop close to the route. If you are planning to travel by road, board a bus to Sakleshpur from Mangalore, Hassan or Bangalore.